Ever since Apple introduced iBeacon technology in the summer of 2013, there has been a lot of excitement over the opportunities of being able to reach out to customers long before they make their way to the retail store, restaurant, stadiums or museums. And now that almost any device, running on Android 4.3+ or iOS 7.1+, that is compatible with Bluetooth Smart is capable of receiving and displaying information transmitted by beacons, these new proximity detection devices have captivated the imagination of officials at zoos, aquariums and theme parks too. To get started in that direction, the first thing that the theme park or zoo needs the most, is a functional mobile app that allows visitors to take advantage of iBeacon technology. We’ve discussed seven steps every brand should take prior to launching their beacon strategy in our earlier blog post. This new proximity-detection technology lets theme parks, aquariums and zoos offer their visitors a more seamless and personalized experience. Additionally, it also helps them enhance personal interactions by triggering location-specific content and alerts to the smartphones of their visitors. If you are just beginning to learn about beacons in general, our Beacon 101 ebook is a good place to start out with. In this post, we will discuss in detail about how beacons can transform visitor experience at zoos, aquariums and theme parks, as a whole. Most theme parks and zoos have voice guides to offer relevant content to visitors. However, most of these devices are quite expensive to maintain and often require staff at theme parks to manually check-in/checkout the devices, thus making it all the more difficult to frequently update content. This is where beacons come into the picture. Integrating beacons into your mobile strategy, lets you offer your visitors with an enhanced multimedia experience that allows them to easily access details about a specific exhibit they are currently looking at, without having to fight through crowds. You could also direct them to a video on the origins of the animal and how it lives in the wild. In this case, beacons are particularly interesting as it allows them to trigger contextual content based on the location of the device. For example, Los Angeles Zoo and Botanical Gardens, drawing 1.6 million visitors each year, recently deployed beacons to revolutionize the way visitors interact and learn about animals in their natural habitat. They leveraged their mobile app named ‘Rainforest of the Americas’ to unlock interactive content in a diverse range of formats, including detailed animal and habitat information, audio, and high-resolution images as the visitors move through the zoo. Moreover, the app also allows visitors to take the content home with them, thus creating a strong customer relationship with the Zoo that extends beyond their visit to the park. During weekends and vacations, finding a parking space in a theme park, zoo or aquarium can be quite a task. Visitors usually drive in only to end up circling round and round in vain looking for a spot, as most of these theme parks are not equipped with a method to let visitors know if the parking lot is full. But with beacons, as soon as a visitor drives in the entrance, you can trigger an alert directing him to the nearest available parking space. And on his way back, you could also help him locate his car with ease. Adding on to that, it also empowers security staff with the ability to remotely identify vehicle owners, in case of an emergency. This feature of beacons is now extensively used at malls to manage parking space. When it comes to theme parks and zoos, visitors often feel overwhelmed and lost by the sheer number of rides, shows and exhibits. This is where beacons come into play. These new proximity-detection devices, are equipped to easily identify the direction in which your visitors are heading and tell them where exactly they are on the virtual map of the park or zoo. Moreover, by choosing the exhibit or ride, which they would like to see beacons can plan the route and direct them to their desired locations within the venue. For example, you can allow users to monitor wait times at some of the most popular rides up-to-the-minute or trigger notifications when a show that they have favorited is about to commence. This is a great way to foster engagement while making sure that your visitors get the maximum out of a particular visit to the park. You could also use an interactive map to provide your visitors with a walking path that clearly shows both the starting and ending points along with estimated walking time. Moreover, with access to real-time statistics, you can even use beacons to recognize hotspots and alerts security staff about locations that are overcrowded and more prone to security breaches. For example, Fluwel’s Tulpenland (Tulip Land), a theme park that specializes in displaying Dutch tulips, recently adopted iBeacon technology to helps visitors navigate through the park by directing them to other interactive locations. Most visitors find it very taxing to upgrade their stay, or pay for a meal at theme parks, as it often requires them to wait in line for long. Now with beacons, you can allow your visitors to avail spur-of-the-moment upgrades and skip waiting lines at rides or check the lunch menu and make dining reservations accordingly. You could also allow your visitors to pre-order meals on the go for easy pick up at select locations. Adding on to that, beacons can also help your visitors avoid waiting in line to collect a photo of them on that crazy ride. All you need to do, is to deploy a beacon next to the booth at the exit of the ride and activate a series of actions that allow your visitors to choose a picture by entering the corresponding code and pay for it to have a digital copy sent to them on their smartphone. Just as in the case of events, when it comes to theme parks or zoos, gamification plays a very crucial role in presenting relevant incentives in a more engaging and fun manner. For example, you could organize scavenger hunts to encourage your visitors to explore the less popular rides at your park or new exhibits at your zoo by offering them special rewards for doing so. For example, you could make your visitors collect badges as they visit various exhibits at the park and thus earn valuable in-park rewards. You could also reward them for certain valued actions such as submitting a feedback form with free coupons or merchandise. Visitors with special needs can be offered better services through beacons. 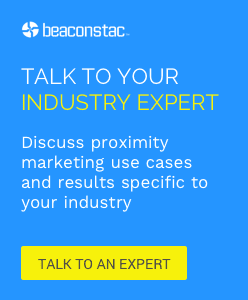 Beacons help you create a virtual map of the venue, such that it is visible and hearable to those who are challenged. This new proximity-detection technology allows you to provide visitors with motion disabilities, hearing difficulties and those who are visually challenged with additional information based on their needs, thus ensuring that they can navigate with ease. With beacons, your visitors will no longer have a tough time managing their kids. You can provide your visitors with a wearable wrist band that comes with a built in locator, that allows them to keep track of their kids on the mobile app. All they have to do is set the maximum distance that their kid can go to, and when that limit is exceeded it will trigger alerts on their mobile device. Moreover, beacons can easily direct them to their kids, by identifying their current location and the direction in which the are heading. You can also use beacons to collect massive amounts of data such as the busiest hours throughout the day or week, customer dwell time at beacons and number of beacon hits within a specified time and accordingly manage your staff activities better. For example, in the case of theme parks, you could use these real-time analytics information it to determine when more staff should be added to help out visitors at various rides. You could also use data about customer preferences to craft contextual messages alerting them about any new addition to your theme park or zoo. Thus, by enabling parks, zoos and aquariums to breathe fun and life into the traditional visitor experience, beacons are believed to be an integral part of any theme park’s or zoo’s digital strategy in the near future. Thanks for this good and very useful post. Can you provide any post like this “to implement Beacons in Casinos”.